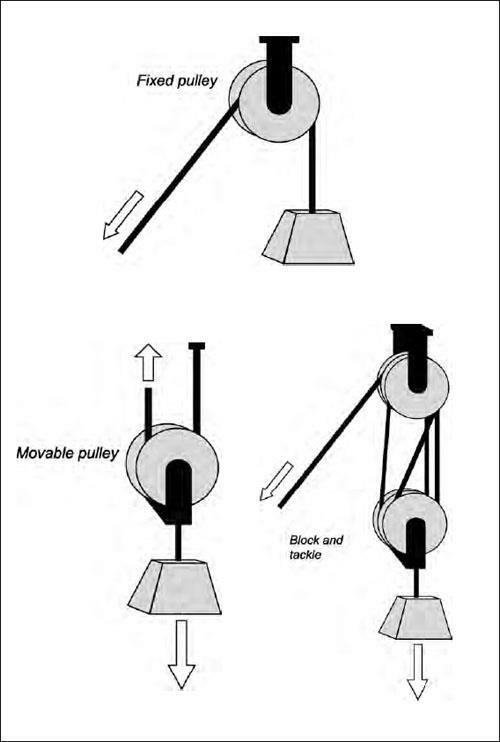 Are there other ways pulleys can be used? Two or more pulleys, on fixed axles, can be connected together with a belt. If the two pulleys are of different diameters, then the one with the smaller diameter will turn faster, and thus it can exert a larger torque. In your automobile one or more pulley and belt systems are used to deliver torques from the engine to the valve crankshaft, the water pump, the air conditioning compressor, and the alternator. Continuously variable automobile transmissions are used in a few modern cars to connect the engine to the drive shaft. The torque that can be delivered by an engine depends on the rotational speed. The torque is maximum at an intermediate speed. A transmission is designed to allow the engine to revolve at a speed where it can deliver torque to the drive shaft, the axle, and the wheels that are revolving at a variety of speeds. When the auto is accelerating from a stop the wheel rotation speed is slow, and so the transmission needs to match a large-diameter pulley attached to the engine to a smaller one connected to the driveshaft. On the other hand, when the auto is traveling at a high speed, the engine can revolve at the same or even a smaller rate than the driveshaft.